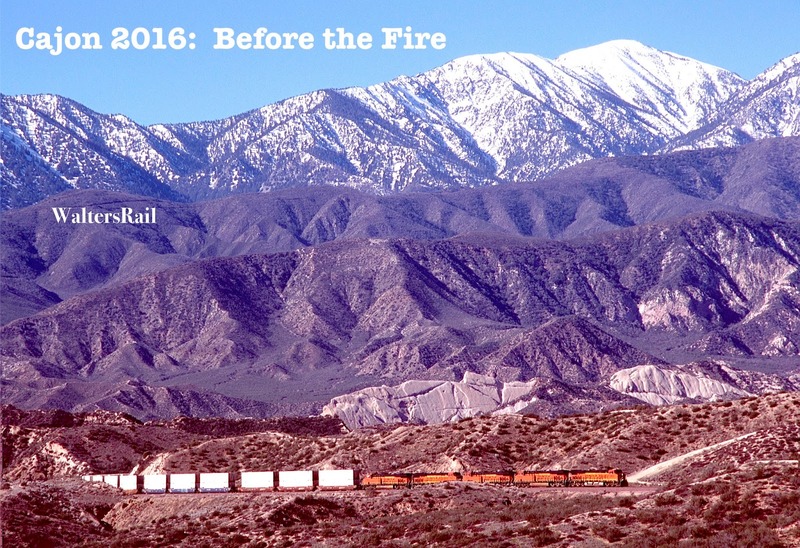 Twice during 2016, I visited the Los Angeles Basin on business trips, once in January and again in August about two weeks before the Blue Cut Fire, which burned thousands of acres all the way up Cajon Pass and into the Mojave Desert. I was able to photograph the pass on both trips, after my business was finished. The images presented here show a landscape yet to bear the scars of that conflagration. 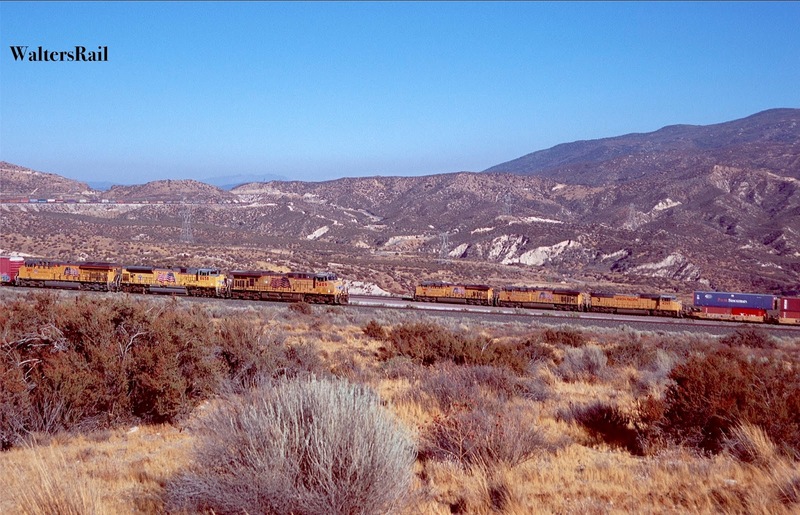 Cajon Pass is a natural stairway leading from the lower elevation of the Inland Empire – the easternmost reaches of the urban sprawl known as Greater Los Angeles – to the high plateau of the Mojave Desert. As you approach the pass on Interstate 15 from the southwest, all urban development suddenly stops, as though a bomb were recently detonated. Actually, urbanization stops at the boundary of the San Bernardino National Forest, which surrounds Cajon Pass and leaves the area unblemished from condominiums, gas stations, billboards, chain restaurants and the like. 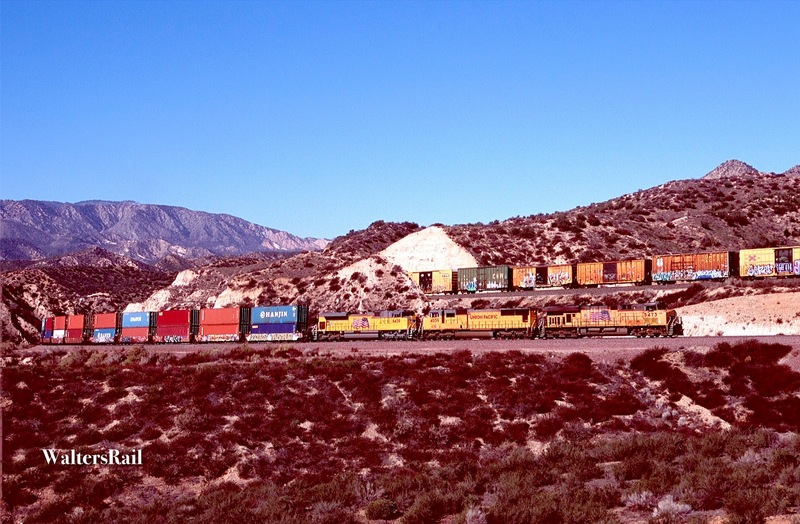 Driving into Cajon Pass from Los Angeles is a little like driving through a door into the 18th century, before European settlement of what we now call southern California – if you ignore the freeway, railroads and electric lines. Okay, so that maybe is not the best analogy, but you know what I mean. Elevation at the summit is approximately 3,800 feet. Elevation of San Bernardino at the bottom is approximately 1,000 feet. The distance between the two is about 20 miles. 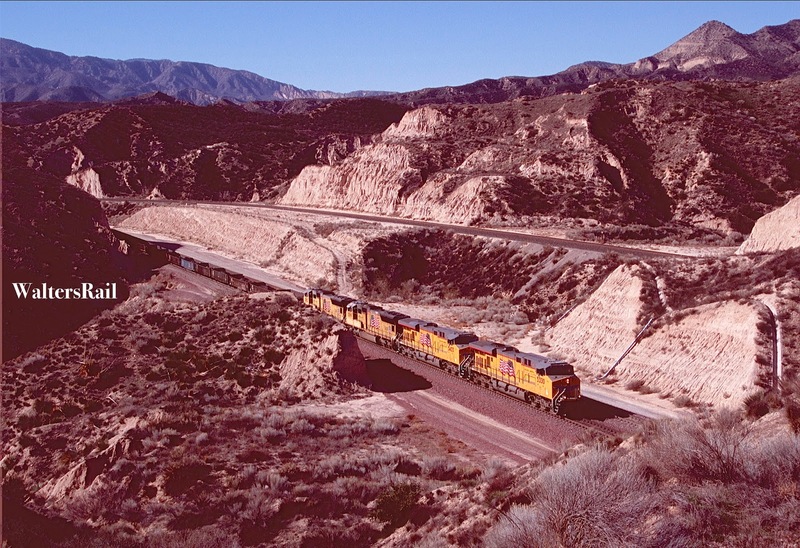 The grade is one-way – from southwest to northeast. In places, the pass is not even a mile wide and contains some of the most fascinating geology in North America. Right here, where highways, railroads, high pressure gas lines and high voltage electric lines all run side-by-side, the earth is both rising and turning simultaneously year after year, enough that all transit modes through the pass must be continuously realigned to avoid rupture. When the next major earthquake occurs – and it is a matter of “when,” not “if” – it is fair to say that all hell will break loose. 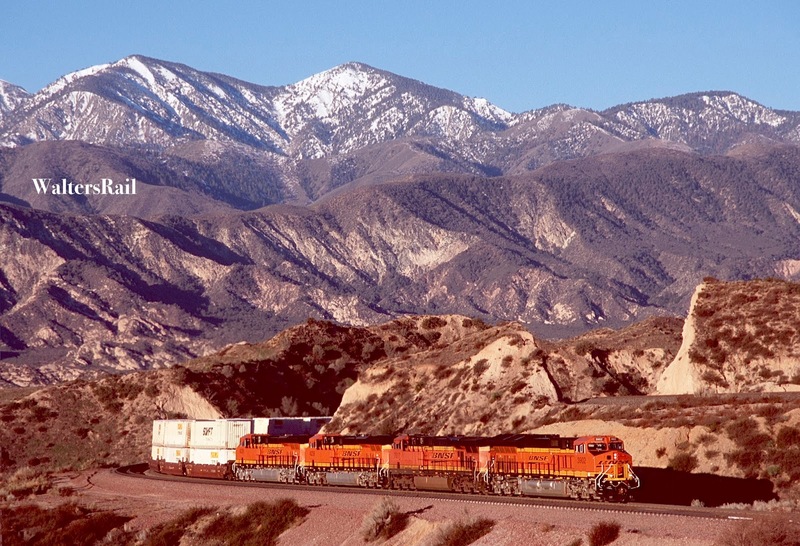 From the east, Cajon Pass is the only route through the mountains into the Los Angeles Basin. European settlers coming into the area began using the pass around 1830. The first two long-distance trails through Cajon were the Old Spanish Trail (which started in Santa Fe, New Mexico) and the Mormon Road (which started in Salt Lake City, Utah). In 1861, an entrepreneur (some used the term “bandit”) named John Brown (not of Civil War notoriety) built a wagon toll road through Cajon Pass which caused much controversy and even led to a judicial case, Driggers v. Lane, in which the Plaintiff argued that the Defendant had failed to pay the required toll on at least three separate occasions. Defendant argued that the obligation to pay the toll had been released because of poor maintenance. Apparently, the road was in such bad condition that the defendant had been forced, at one location, to disassemble his wagon and carry it piece by piece over the rocks. The case was argued in San Bernardino County on October 3, 1875. After a short deliberation, the jury found for the Plaintiff. The decision was not appealed nor were there any other lawsuits, but the issue of excessive tolls and poor maintenance did not subside until the turnpike became a public road. 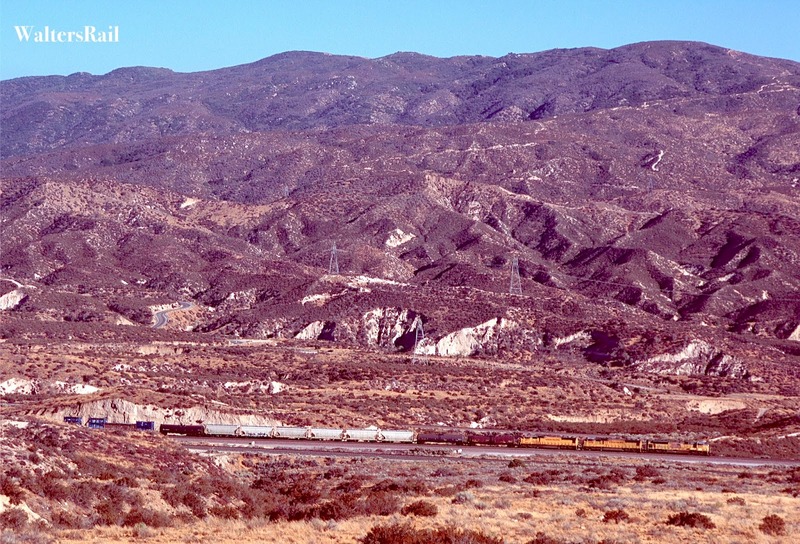 Cajon Pass separates the San Bernardino and San Gabriel Mountains. The high and rugged San Bernardinos, on the east, top out at 11,489 feet at San Gorgonio Mountain – the tallest peak in Southern California – and run approximately 60 miles to San Gorgonio Pass. 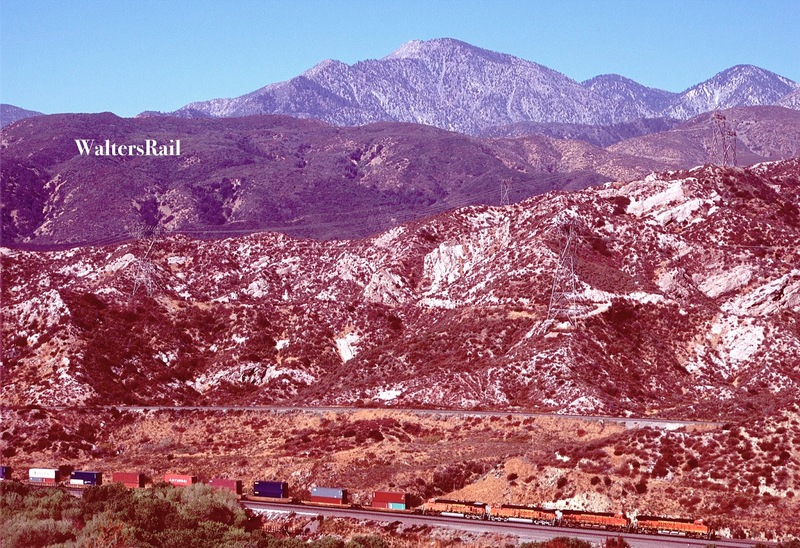 The San Gabriel Mountains are located north of the Los Angeles Basin and west of Cajon Pass. 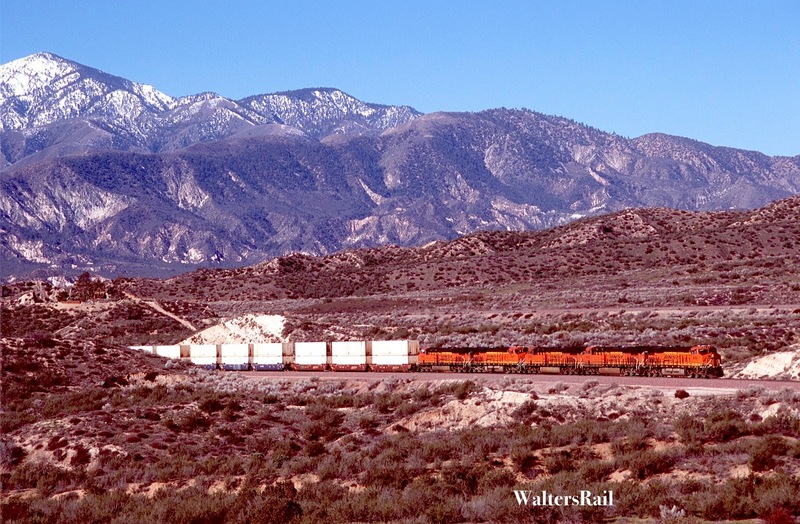 When you come southwest through the pass on I-15 and enter San Bernardino and the Inland Empire, the mountains on your right (west) are the San Gabriels. 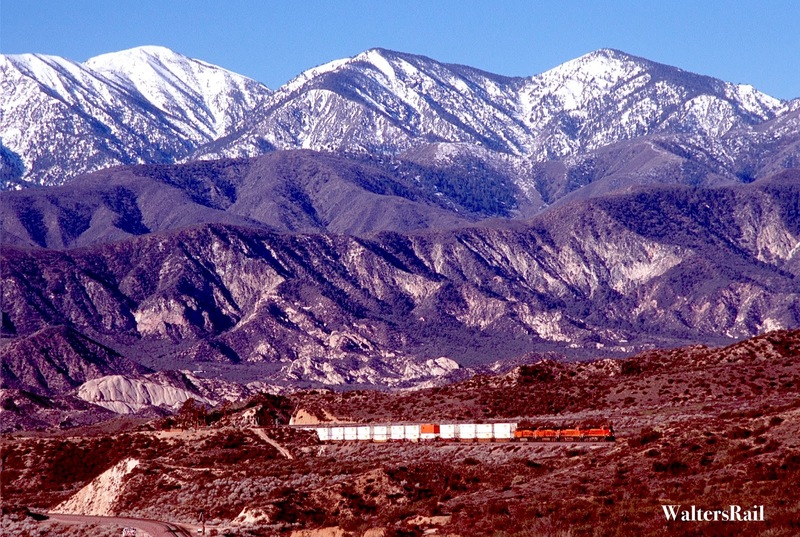 Their highest peak is Mount San Antonio (10,064 feet), commonly called Mount Baldy. Mount Wilson is also famous for the observatory that bears its name. 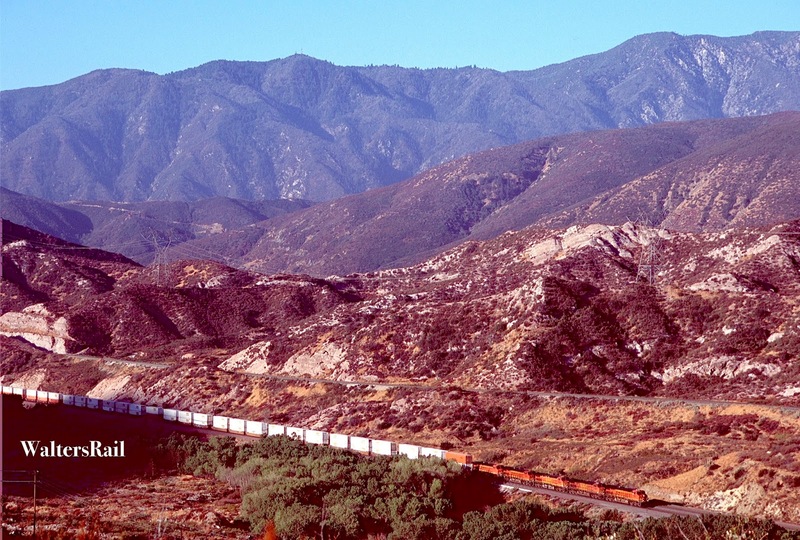 The San Gabriel and San Bernadino Mountains are what geologists call “fault-bounded blocks,” meaning that they have been created, and are still being created today, by uplift from the collision of tectonic plates. When two plates meet, one is forced down, the other up. The plate going up creates mountains. To get a feeling for how this process works, take a sheet of paper and push the two ends together. The paper rising in the middle is a mountain range. 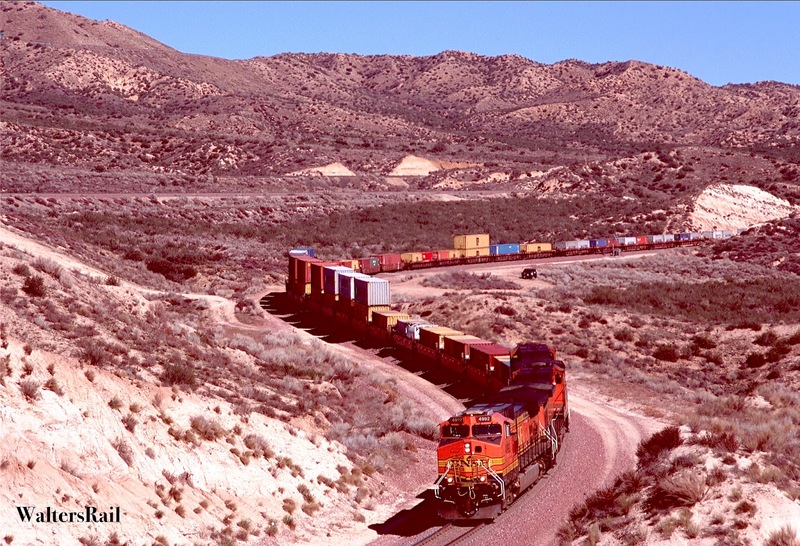 Westbound UP manifest crawls downgrade on BNSF double track. 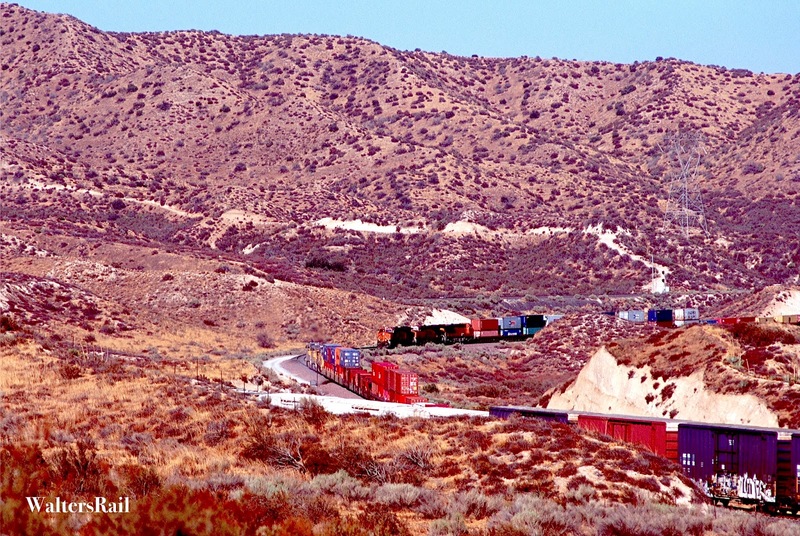 The Palmdale Cut-off is in the foreground. 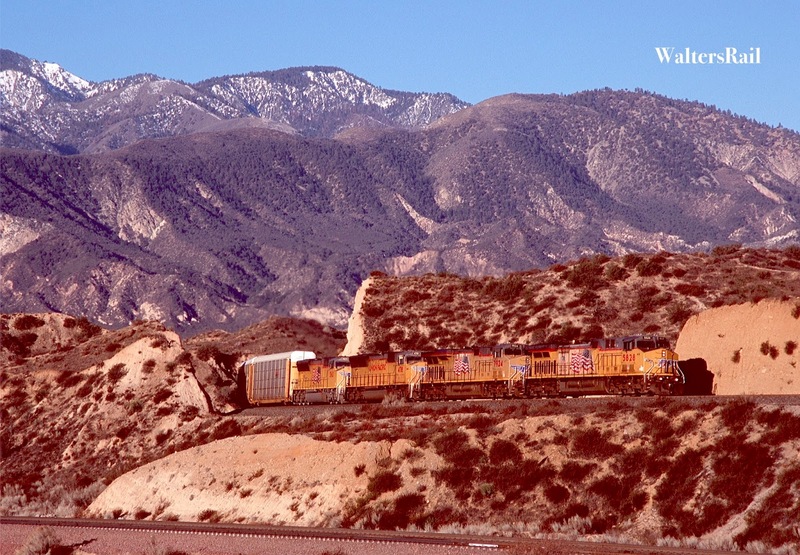 The original 1885 grade is above the motive power, with the western edge of the San Bernardino Mountains in the background. The two plates causing the uplift are the Pacific Plate and the North American Plate, which come together at the San Andreas Fault, which runs directly across the pass at Blue Cut. 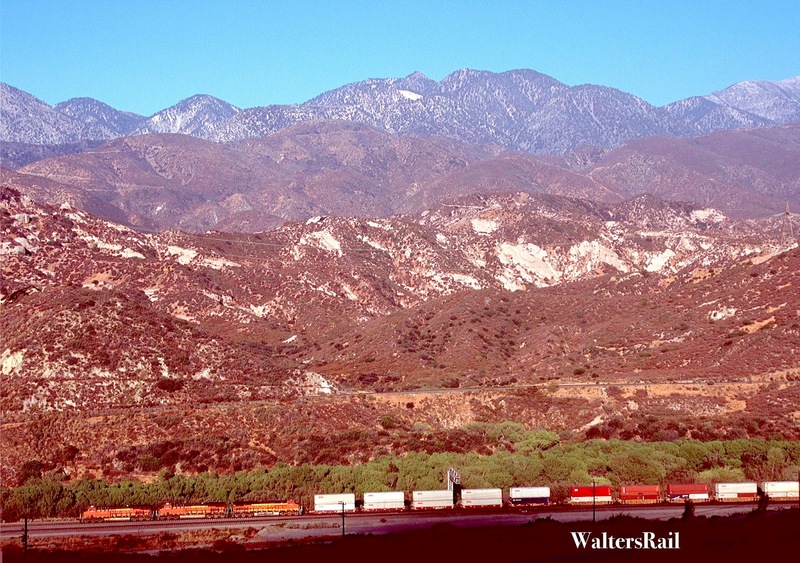 The lower end of Cajon Pass consists of a huge alluvial deposit two miles wide. 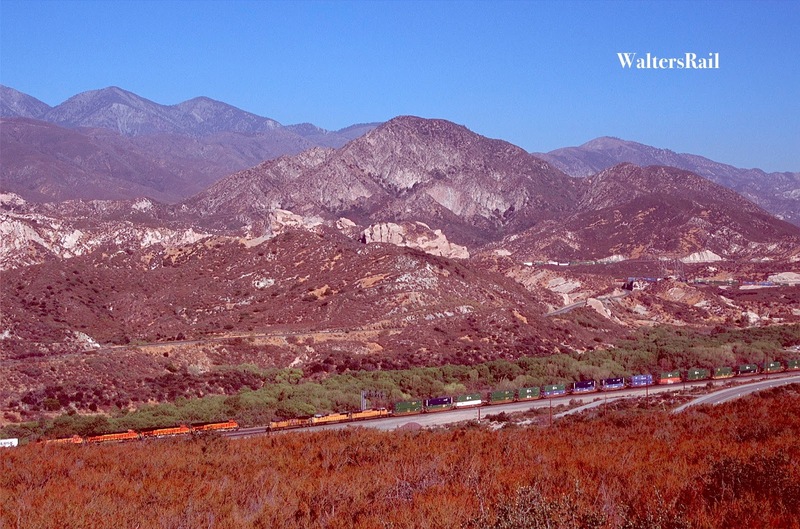 About 5 miles above Devore is a narrow gorge eroded by Cajon Creek known as Blue Cut. 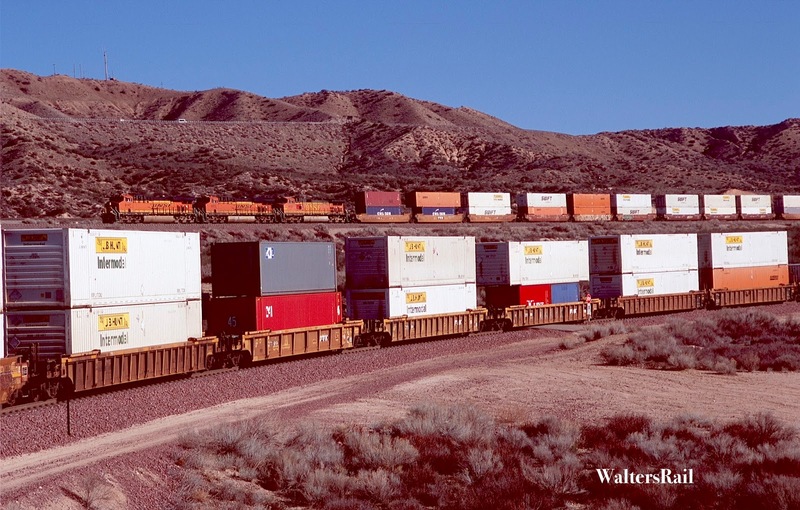 This became the logical path for the railroad, which first came through in 1885. It was also the route of old Highway 66 and is the narrowest portion of the pass. Now you may have noticed that your paper mountain is smooth while the mountains surrounding Cajon Pass are deformed and craggy. This is because the ranges are fragmented by faults of many different ages and have been eroded by water and wind over the eons to form deep canyons, the sides of which are blanketed by rock debris washed out to the range fronts and deposited on the valley floor as large alluvial fans, such as the one at Blue Cut. 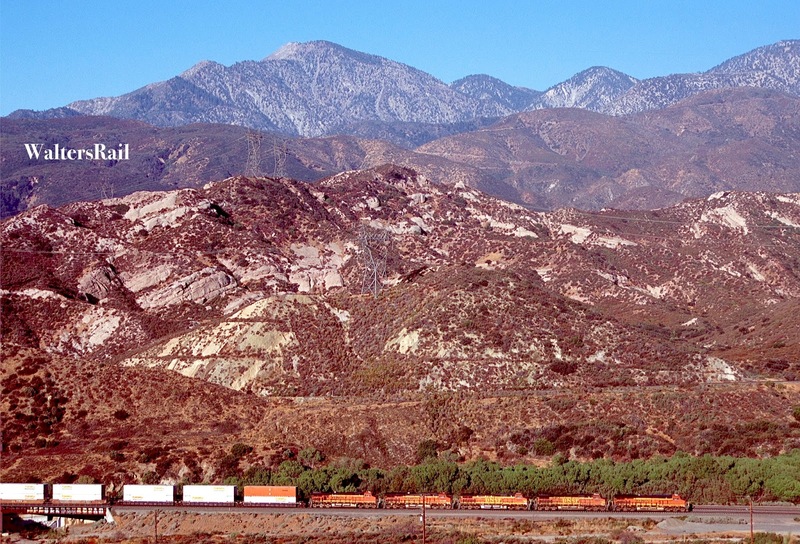 The most notorious feature of Cajon Pass is the San Andreas Fault, the biggest in California, which runs northwest to southeast through the pass, with the Pacific Plate to the west and the North American Plate to the east. Lost Lake sits directly on top of the fault and is called a “sag lake” – one where ground water seeps up through cracks created by movement of the rocks along the fault line. To find Lost Lake, take the Kenwood Exit from northbound Interstate 15, turn left, pass under the highway, then turn right onto Cajon Boulevard (old Route 66). You will be driving on what should be the southbound lanes of an old four-lane highway. The two northbound lanes are now closed. Westbound stacks roll slowly down the original 1885 alignment. 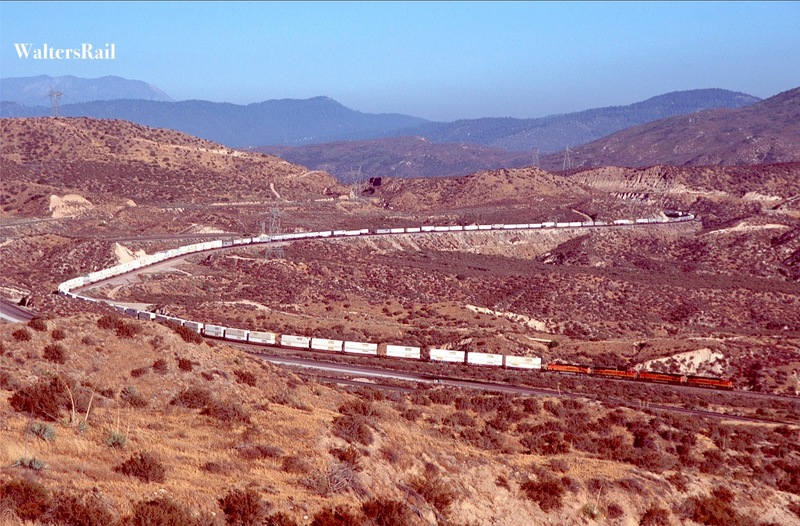 The 1913 second track (with the new third track) and the Palmdale Cut-off rest peacefully above the train, awaiting the traffic that will soon arrive. When you come around the curve, you will see a marker for Blue Cut on the north. The San Andreas Fault lies about one-quarter mile directly ahead on the highway, crossing at almost a right angle. You can identify the location of the fault where the canyon walls drop to ground level on either side of the highway and you feel as though you are driving through a creek bottom. To the east, Interstate 15 crosses the defilement on a huge fill. Much of the rock in Blue Cut and in some of the preceding cuts farther downgrade is laminated, dark blue-gray Pelona schist, a major part of the terrain southwest of the San Andreas fault. The rock in Blue Cut bears a slightly greenish tint, much broken by the stress and strain of being alongside the San Andreas fault for millions of years. The rocks on either side of the fault are moving at slightly different rates. 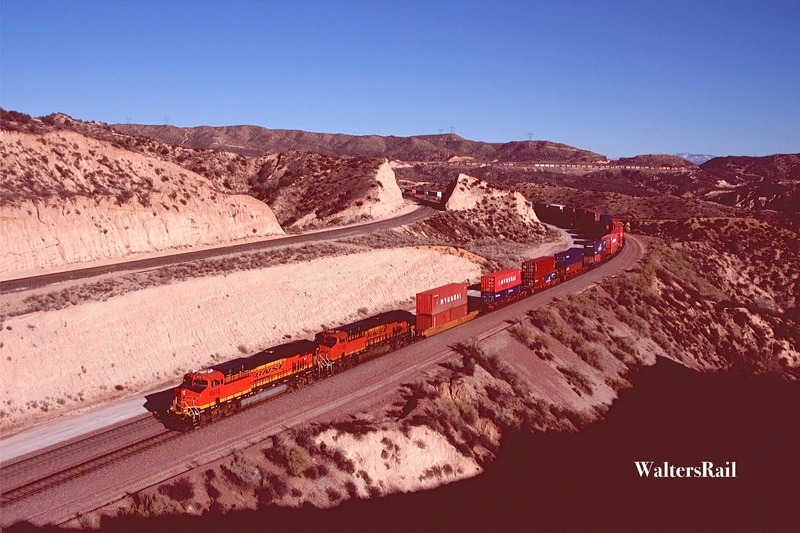 There is enough displacement, a few inches per year, that both the Union Pacific and BNSF must send crews out twice a year to realign their rail. 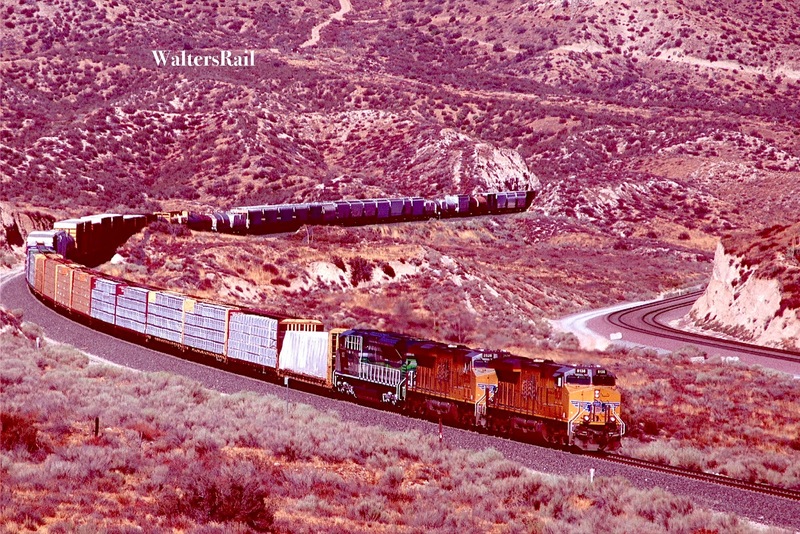 Otherwise, the tracks would twist, much as has old Route 66. If you look carefully, you can see a number of places where the old road is slowly pulling itself apart. Approximately one mile past the fault line you will come to Swarthout Canyon Road, which runs for miles more or less directly on top of the fault to the west. 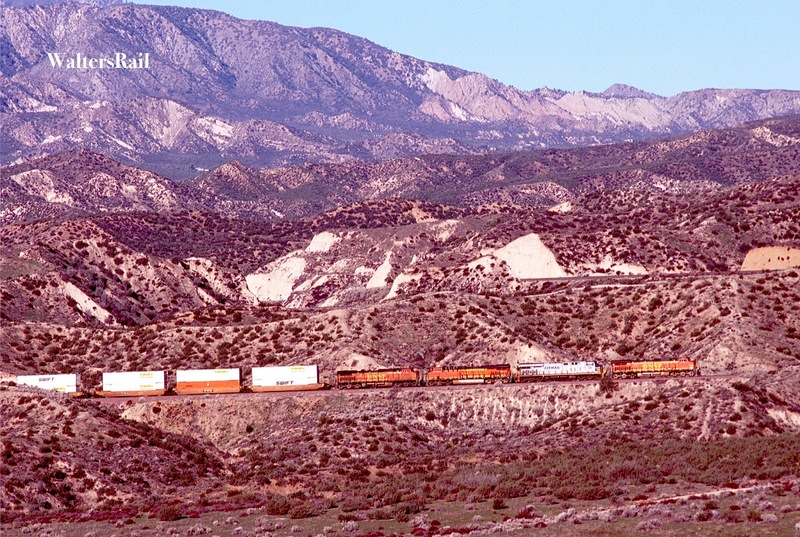 Turn left onto the dirt road, cross the BNSF tracks, then cross the single track of UP’s Palmdale Cut-off and you will eventually find a quiet little area that should not exist, because there are no streams, creeks or rivers to feed Lost Lake. Instead, the water seeps up through the San Andreas Fault. In the past, the water has been cool and deep. However, on my last visit in August 2016, the small lake was almost completely dry. I do not know why the water has vanished. I wonder if it is an indication of how far the water table has dropped in southern California. Sources I have consulted indicate that the last earthquake in Cajon Pass associated with rupture on the San Andreas Fault occurred around 1700 AD. At least two earthquakes ruptured the fault after 1290 AD, with possibly six more in the preceding thousand years. My winter trip to the pass concentrated on the area from Alray to Summit, a distance of about three miles. Here the tracks come out of the canyon crossing the San Andreas Fault and curve broadly from west to east up the northern slope. 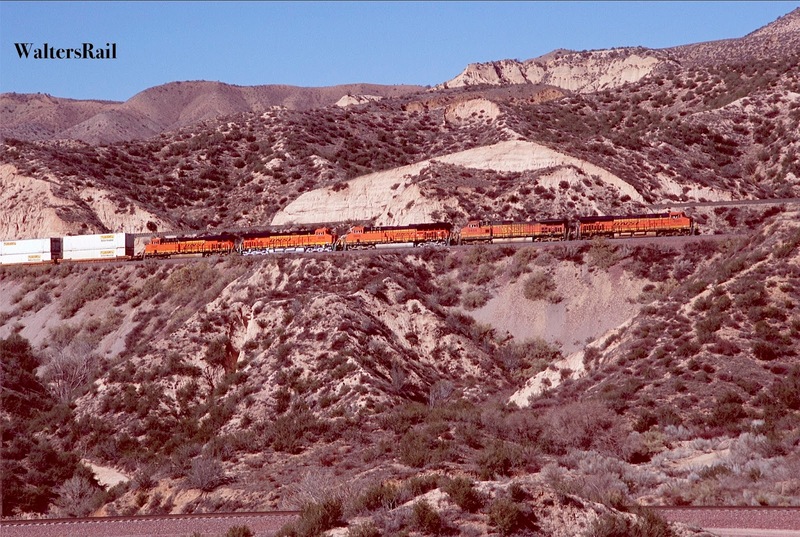 Four different tracks actually climb the grade to the Mojave Desert. 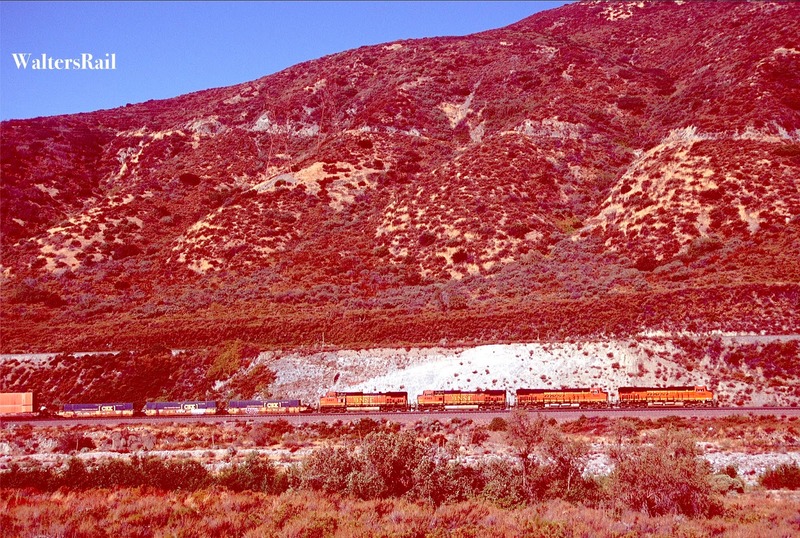 The original line was constructed by the California Southern (later acquired by the AT&SF) and opened in 1885. Near the top, the grade was three percent, which meant that almost every eastward movement required multiple helpers. 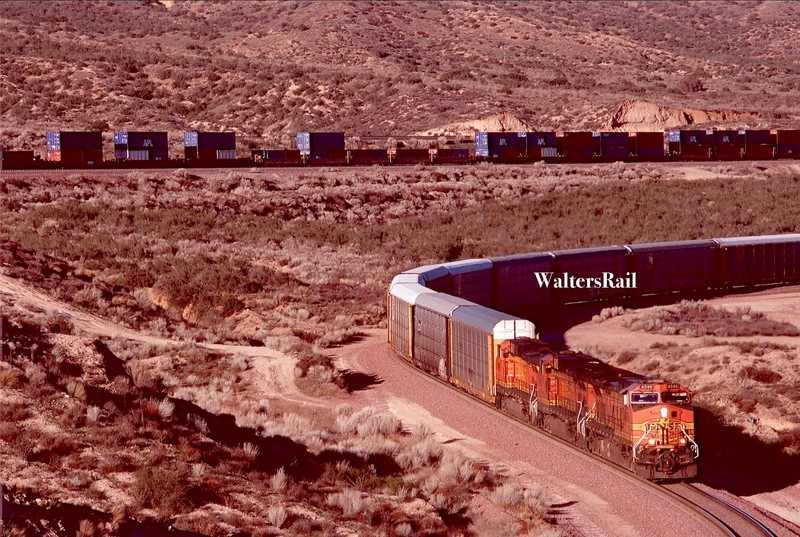 In 1913, the Santa Fe constructed a second line, following the original route as far as Alray, where the newer line diverged on a more northerly approach that lessened the ruling grade to 2.2 percent. The newer second line also bored through two tunnels, the only two in the pass. The tunnels were later daylighted. 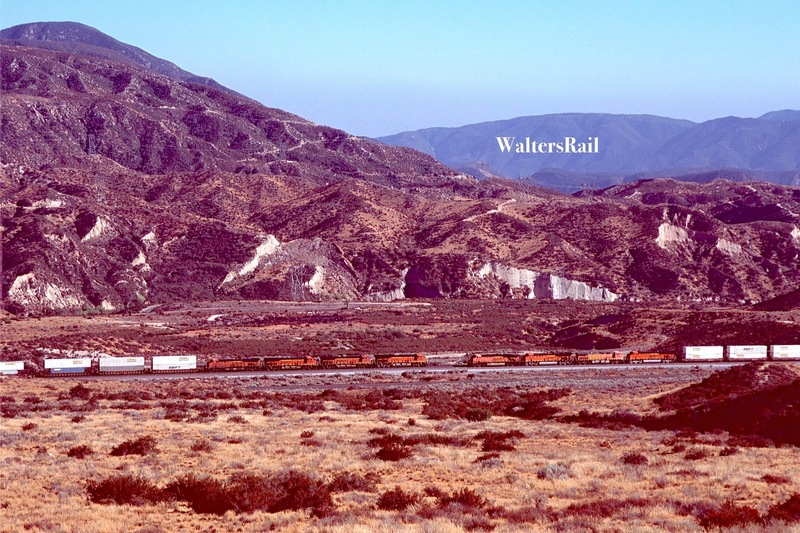 In 1967, Southern Pacific built a new line through the pass, called the Palmdale Cut-off, which allowed trains to and from California’s San Joaquin Valley (via Tehachapi Loop) to by-pass the Los Angeles Basin on their way to and from Arizona and points eastward. The ruling grade on this line was almost three percent. 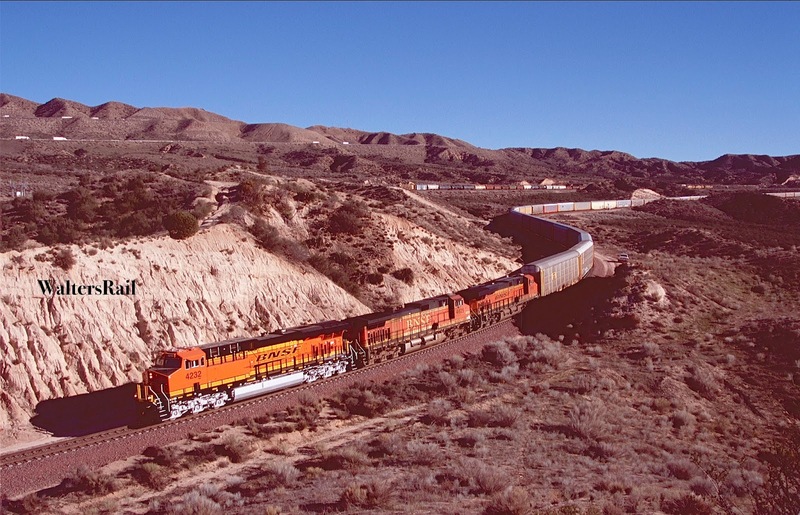 In the early twenty-first century, Santa Fe successor BNSF constructed another track along the route of the 1913 construction, giving the railroad three lines through the steepest part of the grade. 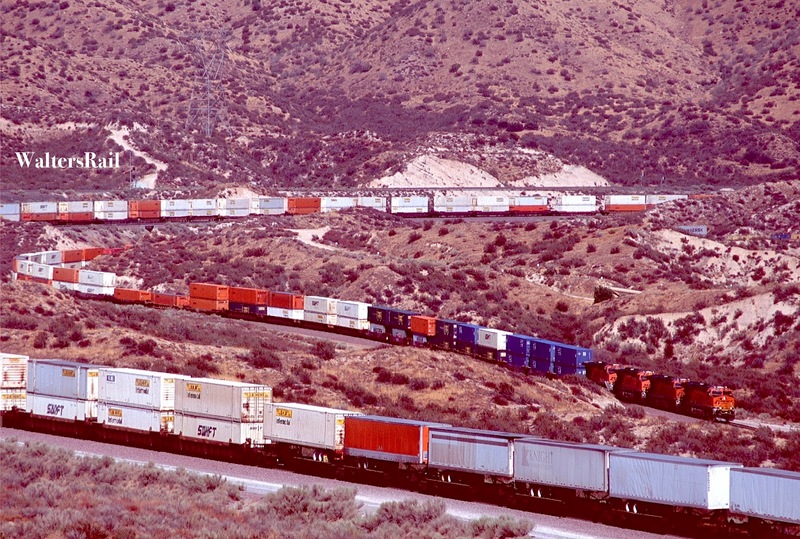 Cajon Pass has seen many runaways over the years, the most notorious of which occurred in May 1989, when a Southern Pacific freight lost control and hit a residential area in San Bernardino, killing two civilians, as well as the engineer and conductor. 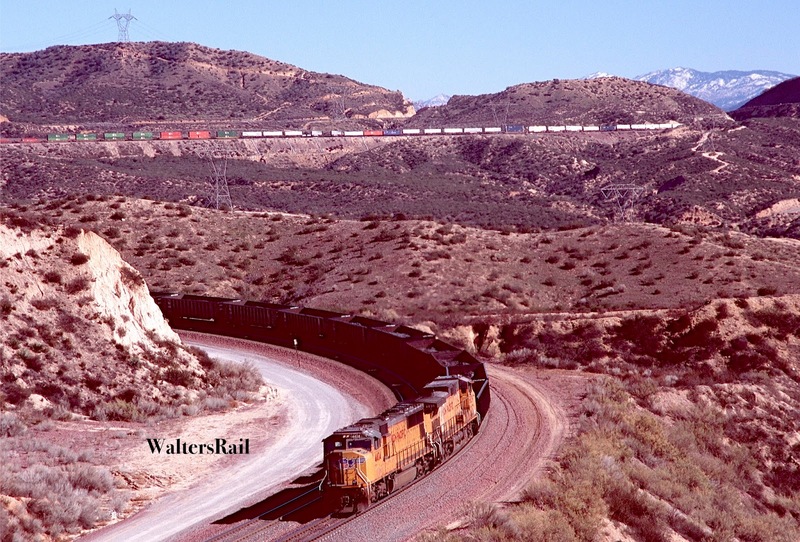 In 1996, a Santa Fe manifest lost its brakes coming down the pass on what was then Main #1 (now Main #3), the original 19th century alignment, and jumped the 35 mph turn at Stein's Hill at over 70 mph, killing two crewmen. A monument now stands in their memory. Today, westbound trains creep downgrade, some going so slow that you can almost walk beside them. But they dare not go too slow because of all the traffic behind. 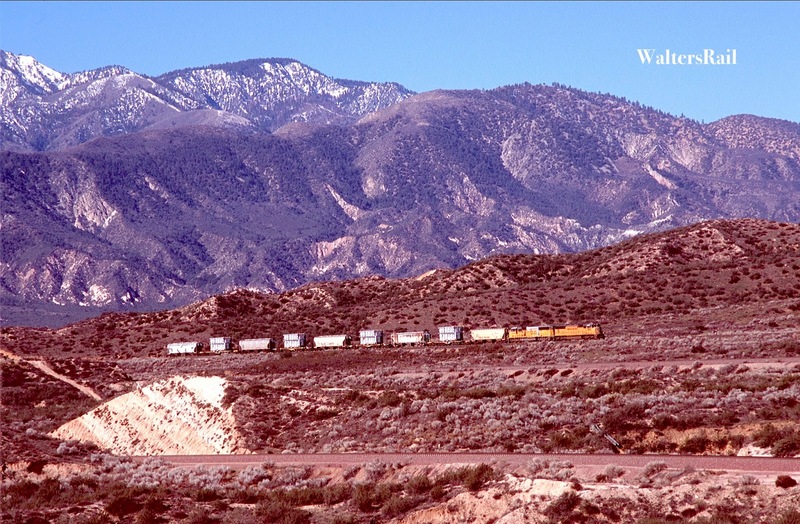 Traffic on the days of my two visits was remarkably heavy, making images of multiple trains a common occurrence. 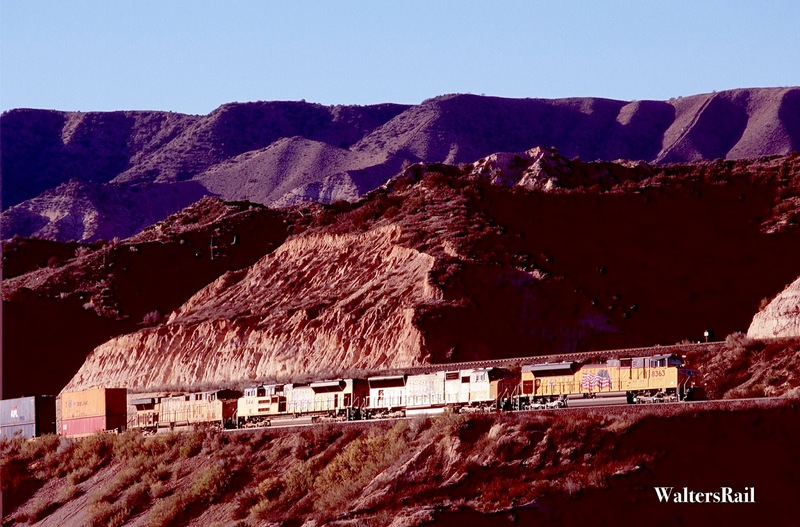 Seeing three trains at once while hearing two more whistling in the canyon below is what a friend of mine calls breathtacular. My August visit concentrated again on the upper part of the grade but this time, because of the sun angle, I was shooting north of the tracks rather than south. 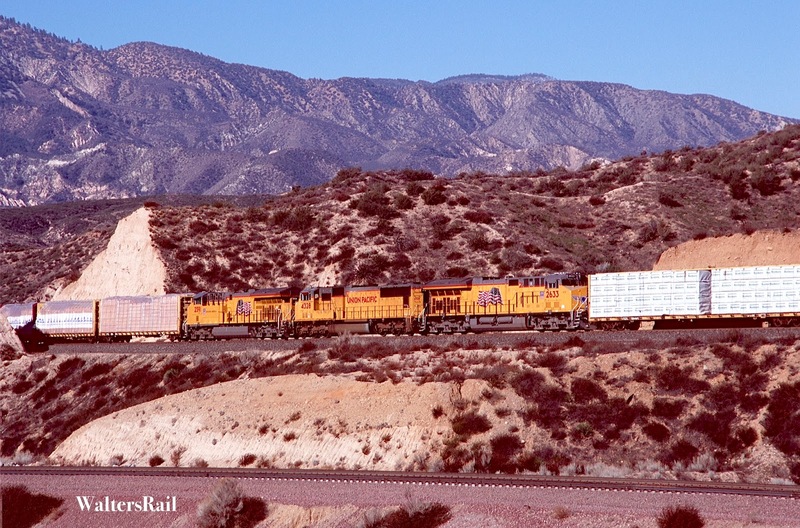 One afternoon, I climbed up the hill to the eastbound lanes of I-15, where I sat just below the highway, out of sight, and photographed train after train with the San Bernardino Mountains in the background. 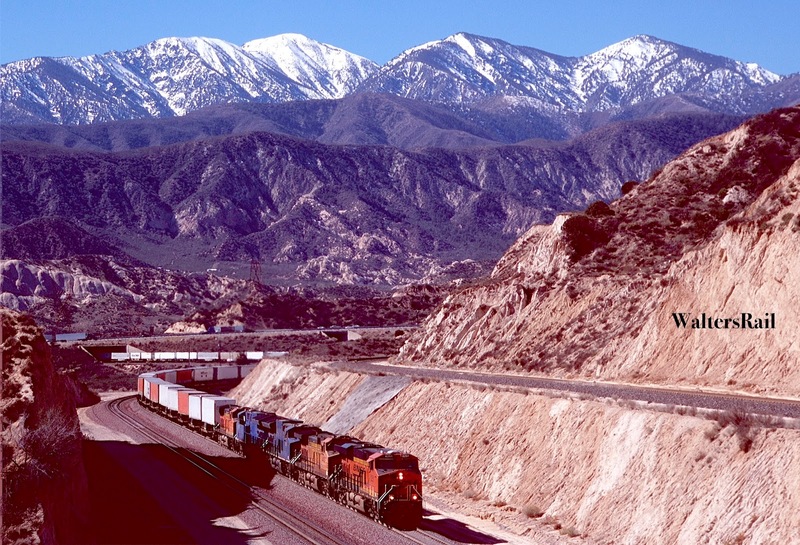 This image shows the upper (eastern) portion of Cajon Pass as it widens toward the summit. 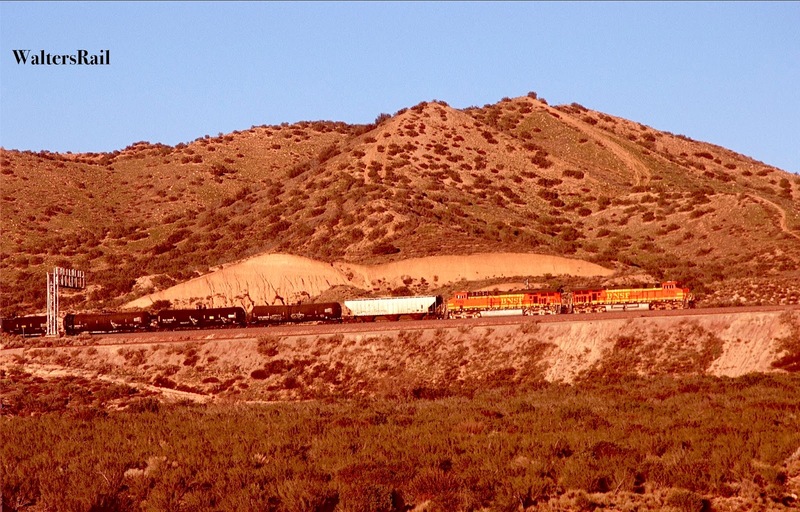 A BNSF auto train is rolling slowly down the original 1885 grade, while a UP manifest struggles upgrade on the 1913 alignment. 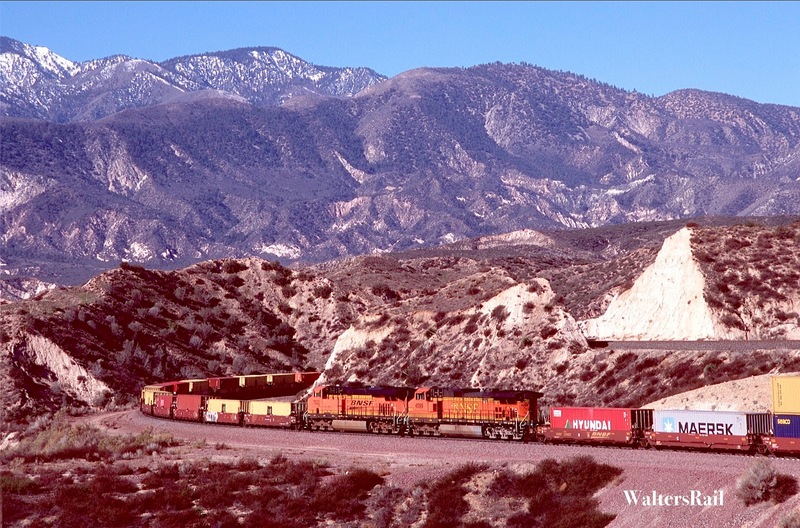 The Palmdale Cut-off runs just above the UP power. The two lanes of I-15 are visible at the top of the canyon. 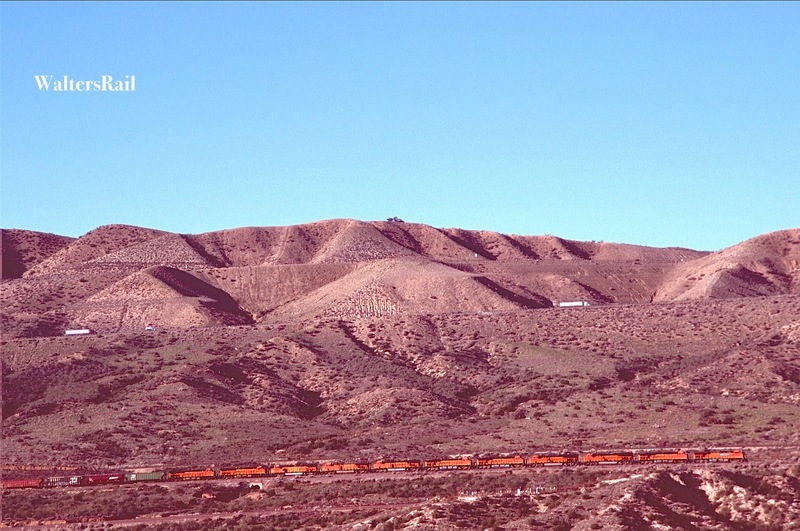 BNSF Stacks roll westward toward Alray. 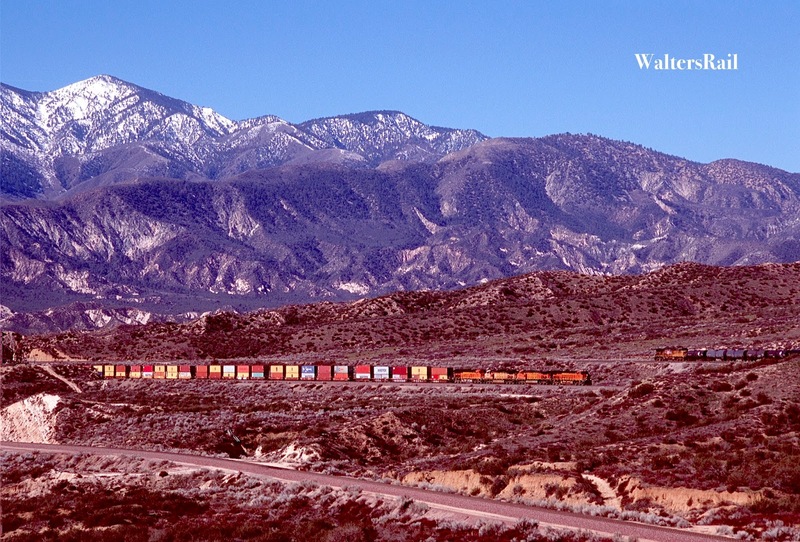 The Cajon Pass summit is in the upper right of the image, directly below Mount Gorgonio. 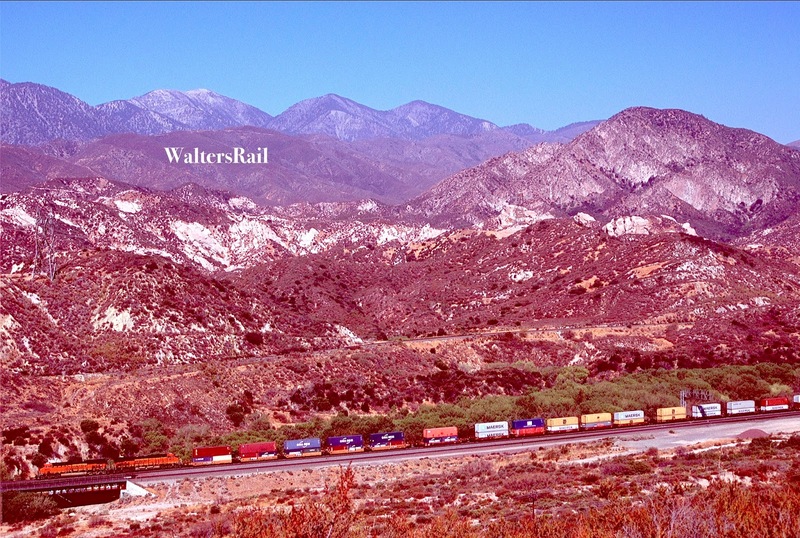 I also spent one morning driving and then hiking along the western edge of the San Bernardino Mountains, looking down into the valley where the tracks approach Sullivan’s curve. My rented vehicle did not have four-wheel drive and would only take me so far up the rugged and steep Forest Service road, which appears to run several miles into the mountains and may reveal some incredible images if I ever return with a Jeep. At the request of local firefighters, BNSF stopped two trains in the pass and removed the crews to safety. Later, the fire department asked BNSF to move the trains, which was difficult because I-15 was closed where the trains were staged. The line opened again in the evening of the 17th with trains creeping through the debris. 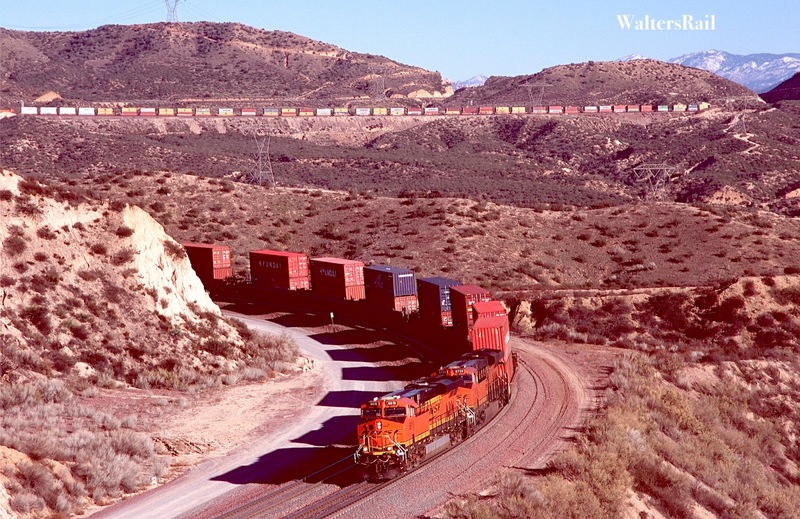 At one time, BNSF had 68 westbound and 11 eastbound trains staged. 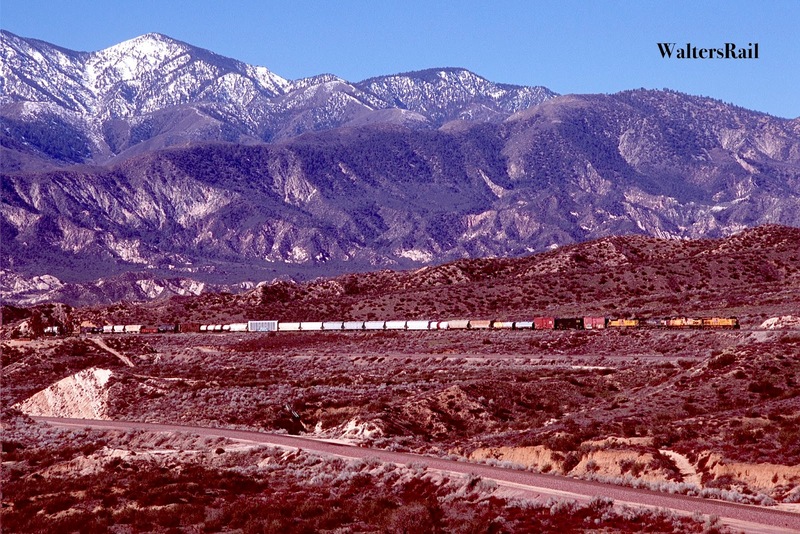 Eastbounders were waiting at either Los Angeles or San Bernardino with no crews called. 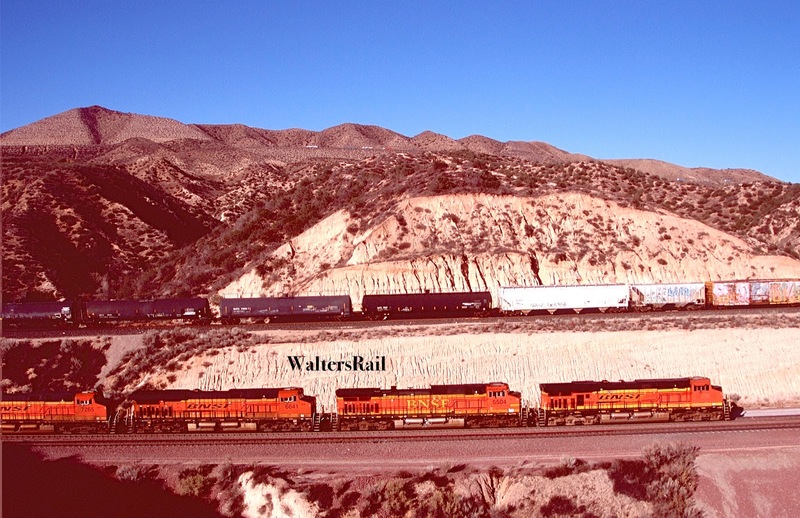 BNSF detoured four trains over the UP between West Colton, California, and Vaughn, New Mexico (two each way). 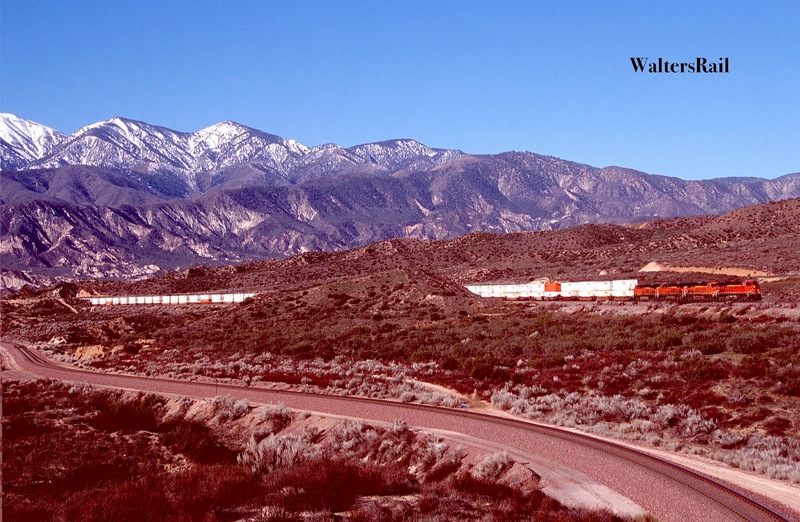 On August 16th, Amtrak routed Train # 4 on the former SP Saugus Line (now Metrolink’s Valley Subdivision) to Palmdale where the tracks joined the UP Mojave Subdivision. 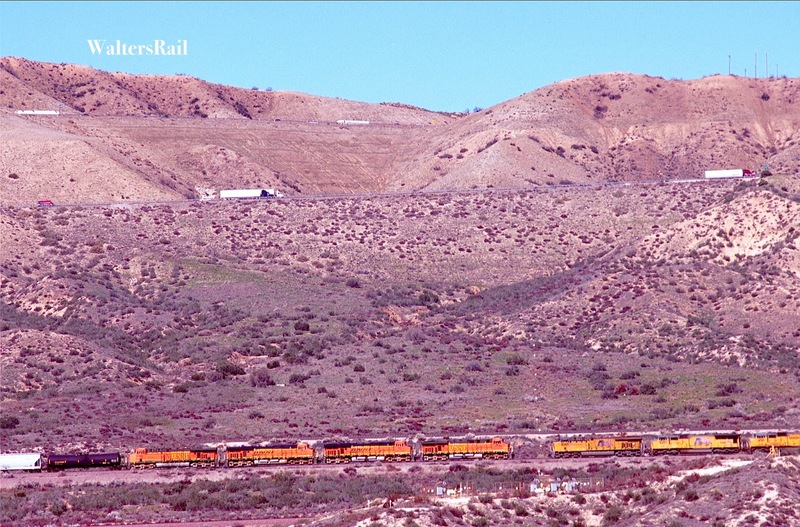 From Palmdale, the train ran to Mojave where it then headed east via the BNSF to Barstow and back on the normal route. Train # 3 the morning of the 17th made a reverse run of the same route. 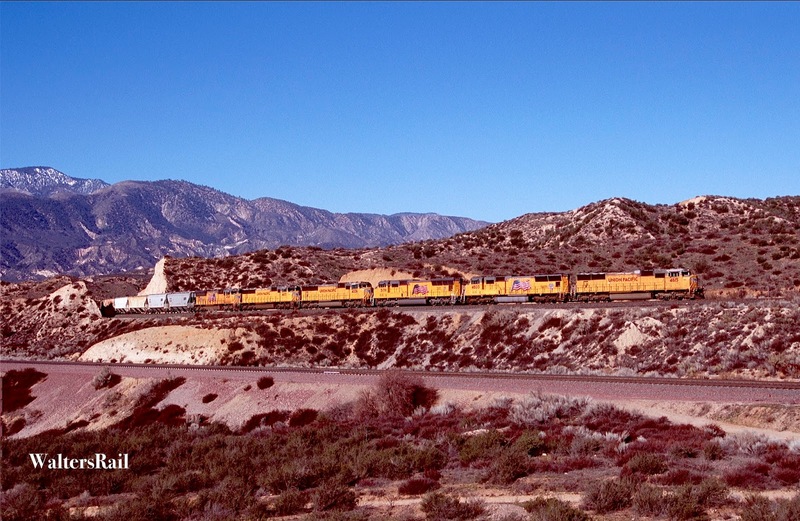 BNSF and UP meet in eastern portion of Cajon Pass. 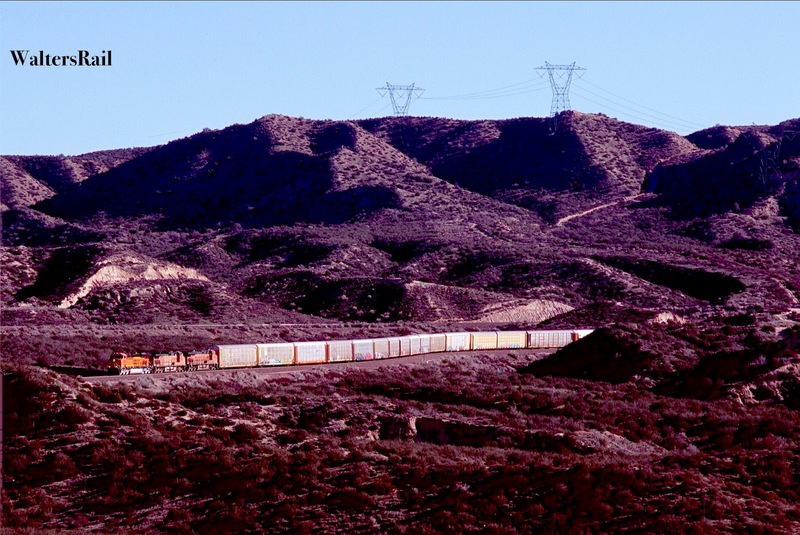 Between the two trains is an antenna rising from a high pressure natural gas facility. This is the most exposed utility in the pass, for when the San Andreas moves again, the pipe will rupture. At the top of the image are the two, separate lanes of I-15. The fire did not cause any major damage to BNSF property. UP, on the other hand, lost a bridge near the BNSF station at Cajon. 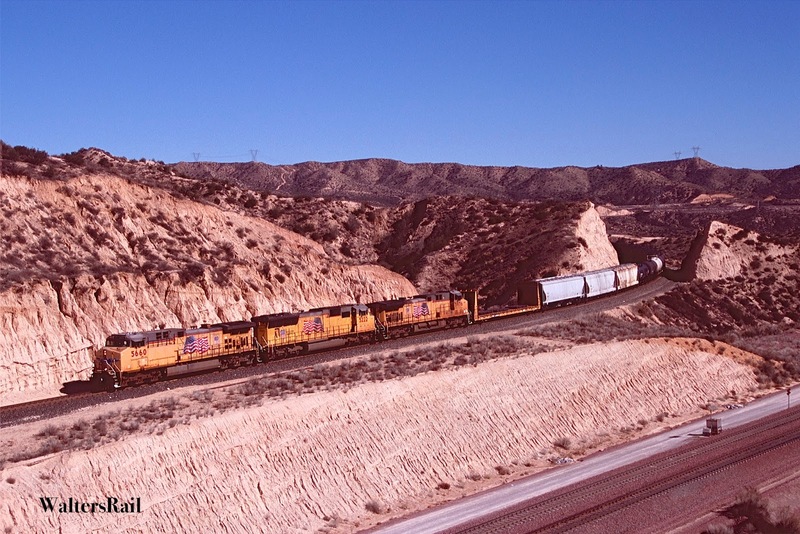 UP detoured some traffic over its own lines from West Colton via El Paso and then up the Golden State Route to Kansas City – trains that would normally run on BNSF trackage rights over Cajon Pass to Dagget, California. Coastal California, where all the people live, does not cycle through four seasons like the rest of the country. Instead, there is a dry season that lasts in southern California from roughly April through November, and a wet season from roughly December through March. In the summer and fall, all non-irrigated vegetation is dormant and tinder-box dry. The slightest spark can be fueled by the strong desert winds and quickly grow into a monstrous conflagration racing across the coastal chaparral and brown grass of places like Cajon Pass at breathtaking speeds. Flames can climb hundreds of feet into the air, while ash falls from the sky like feathers of dead birds. If you have never seen one of those fires, consider yourself fortunate. 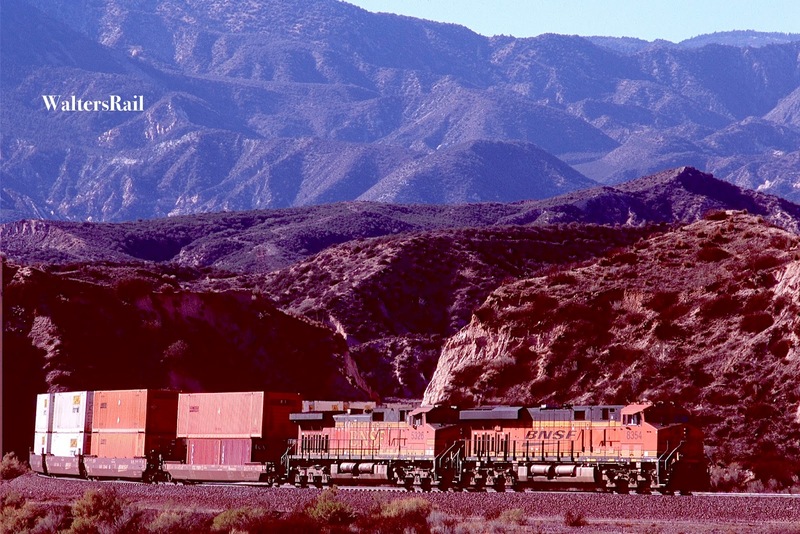 I have not been back to Cajon since the conflagration, but I have seen photographs in which trains appear to be rolling through a post-apocalyptic landscape – chaparral burned to the ground, surrounded everywhere by black ashes – mile upon mile of ashes. The desert will regenerate. If there is enough rain in the winter, the grasses will sprout green as they do everywhere range is burned. The chaparral will mostly come back from seeds, not the roots of burned bushes, a process involving years. Trees in the canyon bottoms will take longest of all. I am sixty-six years old and will be dead before that foliage returns. I am very fortunate to have taken the images in this post before the destruction.